This article by Tom Kenworthy is re-posted from EcoWatch. When it comes to greenhouse gas (GHG) emissions, power plants are the 800-pound gorilla in the room. But a new report from the U.S. Environmental Protection Agency (EPA) shows that oil and natural gas are a pretty sizable monkey on our climate back as well. Reporting for the first time on GHGs from petroleum and natural gas systems, the U.S. EPA this week said that the oil and gas sector ranked second in emissions to power plants, releasing 225 million metric tons of carbon dioxide equivalent in 2011. More than a third of that came from methane, the main constituent of natural gas, and a far more potent global warming gas than carbon dioxide. The oil and gas sector was responsible for 40 percent of total U.S. methane emissions. 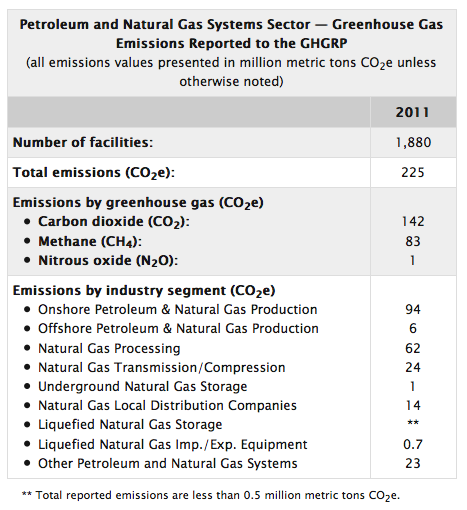 In terms of greenhouse gas equivalent, the sector’s overall emissions were only about one-tenth those of power plants. 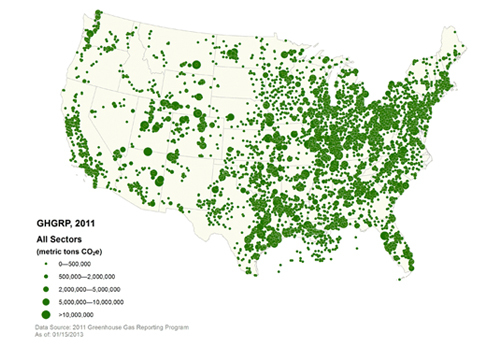 This was the second year that the U.S. EPA, directed by Congress, has reported U.S. GHG emission data. The 2011 data includes a total of 41 sources, 12 of them new in the second year of the program. This year’s release of the data shows that power plant emissions, which account for about one-third of all U.S. emissions, were abut 4.6 percent lower than 2010 levels. Refineries ranked number three on the list of biggest emitters, with about 182 million metric tons of carbon dioxide equivalent.